A lot of people have an investment portfolio that looks like an abandoned storage unit. I know this because my friends, readers, and family members like to show me their portfolios. I’ve seen portfolios with literally dozens of different funds, most of them overpriced and overlapping with other funds, strewn among half a dozen different accounts or more. I’m happy to sit down with a friend and walk through what they can do to fix their portfolio: to make it simpler, cheaper, more diversified, more tax-efficient, and in line with their risk tolerance and goals. Here’s the secret, however: I’m not doing anything a computer program couldn’t do. As much as I like hanging out with friends over an Excel spreadsheet and pulling a Storage Wars on their portfolio, sometimes I wish I could just send them to a website that would do all the work for me. FutureAdvisor, which launched last week (and is a Mint Ways to Invest partner), is by far the smartest portfolio analysis and design tool I’ve ever used. It costs nothing unless you want to talk to a human advisor, and, as with Mint.com, you don’t turn over any of your money to them. “We see as our customer the other 99% who cannot get access to high quality financial advice because they don’t fit the half-million-dollar minimums that human advisors require,” says cofounder Bo Lu. 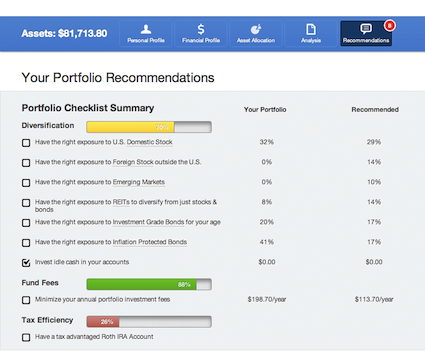 FutureAdvisor is not the first portfolio management tool to hit the web, and I’ve written about others such as Betterment and Wealthfront (both are also Mint partners), which will design a nice portfolio for you and implement it at low cost with a nice interface. What makes FutureAdvisor different? The difference is that the other services ignore your 401(k). Most investors have a substantial majority of their assets in a workplace retirement plan. Any advisory service that ignores that part of the picture is like a kid who agrees to mow your lawn and then gives up after mowing one patch in the corner of your yard. FutureAdvisor already supports over a hundred 401(k)s at large companies, and they are adding more weekly, driven partly by user requests. The software can look into your 401(k), see what funds are available, and steer you toward the best ones. It can also build a single portfolio that stretches across your 401(k), Roth IRA, taxable account, spouse’s accounts, and so on. FutureAdvisor’s portfolio philosophy jibes nicely with mine: they recommend low-cost index funds and ETFs in a lifecycle investing model, which just means that your portfolio should become less risky as you get closer to retirement. And the software is careful to put tax-inefficient assets into tax-sheltered accounts. Why should we trust a computer to design our portfolio? Because most investors already do; this just cuts out the middleman. “Advisors already use software to help them design portfolios,” says Lu. “Software is already an indispensable part of this industry.” That’s true whether you have a human advisor who uses software on her PC, or a target-date mutual fund designed and implemented by computer algorithms. If you want to speak to a human, you can pay $49/year for an annual check-in or $195/year for unlimited video calls. You might even get Lu on the line personally. – When FutureAdvisor gives you specific steps to improve your portfolio, they’re unnecessarily complicated; the software looked at my portfolio and told me to buy a bunch of ETFs instead of just moving money among my existing mutual funds. Lu says they’re working on optimizing the recommendations, including an option to exclude ETFs. – The product needs to support more 401(k)s. There are thousands of 401(k)s out there, and FutureAdvisor only supports 100. Lu knows this. “We’re going to focus on bringing this to more and more people, and that means supporting more and more 401(k)s,” says Lu. – FutureAdvisor has a very narrow view of what constitutes a good portfolio. This is both good and bad. They won’t recommend expensive, actively-managed funds. Great! But their lifecycle model is based purely on age; no matter what I told FutureAdvisor about my situation, I couldn’t get it to recommend me a portfolio with less than 75% stocks. That’s more risk than I need or want to take, but I can’t tell FutureAdvisor that, so it warns me that my portfolio is wrong. – The app isn’t smart enough to advise you to roll over an old 401(k)—yet. They’re working on it. Even with these caveats, however, FutureAdvisor can do a heck of a lot to clean out a portfolio that looks like Grandma’s attic. And it’s free. Go see if it supports your 401(k) and give it a try.